President Hamid Karzai has reassessed his approach to peace and will no longer hold talks with the Taliban. He will instead negotiate with Pakistan, he said on Monday. 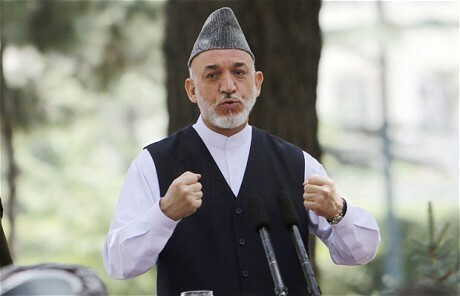 President Karzai has in the past accused Pakistan of harbouring militants in safe havens in its tribal border regions. Over the weekend, Afghanistan’s National Directorate of Security said it had evidence that the plot to assassinate the High Peace Council chief Burhanuddin Rabbani had been hatched in the outskirts of Quetta. Interior minister Bismillah Mohammadi said Pakistan’s spy agency, the ISI, was involved in the assassination. Mr Karzai also accused Pakistan of having a “two-faced policy” against Afghanistan and of failing to provide any support for the peace process. “Over the past five years, we have made efforts to have good relations with Pakistan. I personally made efforts to have good relations with Pakistan. Pakistan should support peace efforts, and should consider the interests of its population because peace will benefit them, he said. In his speech, Mr Karzai said that 2011 will be a vital year for Afghanistan because of the Bonn Conference, which will discuss long-term options for the country, and because it marked the start of the transition of responsibility for security from international to Afghan troops . Mr Karzai said that talks are under way with the US about a long-term strategic partnership and that if the conditions set down by Afghanistan are met then the two nations will sign the document after it is approved by a Loya Jirga, or Grand Council. Appealing to the country at large, the president called on Afghans to come together as a nation. “Now is the time to observe national unity [and] to defend our country for the sake of our country’s integrity. Many members of the Northern Alliance have been slain in recent months â€“ including Mr Rabbani and northern police chief General Daud Daud â€“ causing mounting resentment among its members against the Pashtuns from which Taliban members come. The growing resentment has also stoked fears among the public and observers that the country may once again be sliding towards civil war.